In Marr (Fleetwood) ownership. Did not fish from the port. 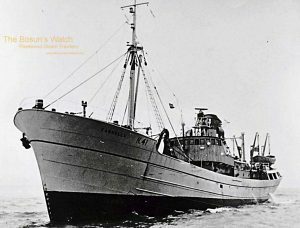 20.11.1948: Launched by Cook, Welton & Gemmell Ltd, Beverley (Yd.No.802) for J. Marr & Son Ltd, Fleetwood as FARNELLA. 9.3.1949: Completed (Geoffrey Edwards Marr, Hull, manager) and registered at Hull (H41). First Skipper, William Rendell Drever. 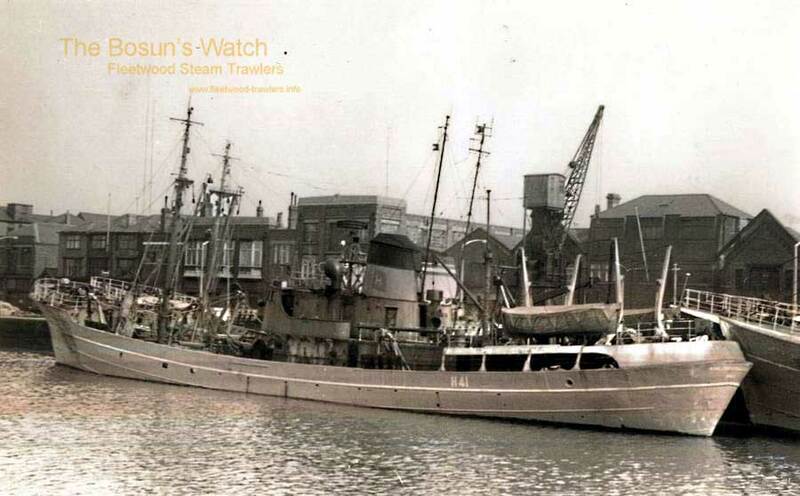 12.1.1952: Sold to Kingston Steam Trawling Co Ltd, Hull (William George O’Dell, manager) for £145,000. Final cost of fitting out and fees, £147,209.4.6d. 2.1952: Escorted steam trawler YORKSHIRE ROSE (H16) 869 miles from Iceland to Hull; payment received £700. 8.2.1952: Registered at Hull as KINGSTON ANDALUSITE (H41). 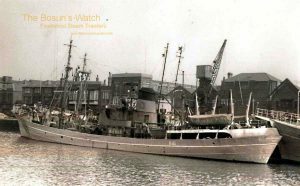 27.10.1954: Shares in Kingston Steam Trawling Co Ltd taken over in equal amounts by Thomas Hamling & Co Ltd, Hellyer Bros Ltd & Hudson Brothers Trawlers Ltd for a payment of £226,000 each. 25.5.1959: Donald Holmes Swift appointed manager. 5.4.1961: Lawrence Hall Swaine appointed manager. 10.12.1961: Amalgamated with Associated Fisheries. 29.6.1966: Sold to Hellyer Brothers Ltd, Hull (Hellyer/Associated Fisheries) (Laurence Hall Swaine, manager). 25.1.1968: Sailed for Icelandic grounds (Sk. Len Whur). 5.2.1968: Stranded whilst entering Isafjordur, Iceland. 6.2.1968: Refloated, repaired for passage to Hull for permanent repair. 12.2.1968: At Hull landed 534 kits grossed £2,738. 26.11.1968: Sailed Hull for Icelandic grounds on last trip (Sk. T. Lawrence). 17.12.1968: At Hull landed 1265 kits grossed £6,047. Laid up. 14.2.1969: Sold to Van den Bossche & Co, Belgium for breaking up. 4.1969: Breaking up commenced at Boom. 1953: 326 days 27,238 kits £67,172. 1954: 325 days 29,609 kits £85,356. 1955: 329 days 36,076 kits £103,075. 1956: 328 days 35,568 kits £102,755. 1957: 325 days 23,095 kits £78,946. 1958: 334 days 24,873 kits £88,777. 1959: 336 days 26,821 kits £83,609. 1960: 337 days 25,712 kits £106,133. 1961: 328 days 21,630 kits £96,264. 1962: 347 days 25,275 kits £89,451. 1963: 334 days 21,040 kits £81,309. 1964: 329 days 21,570 kits £102,394. 1965: 319 days 22,612 kits £106,699. 1966: 303 days 22,494 kits £102,674. 09/06/2011: Page published. 7 revisions since then. 15/12/2018: Removed FMHT watermarks from images. 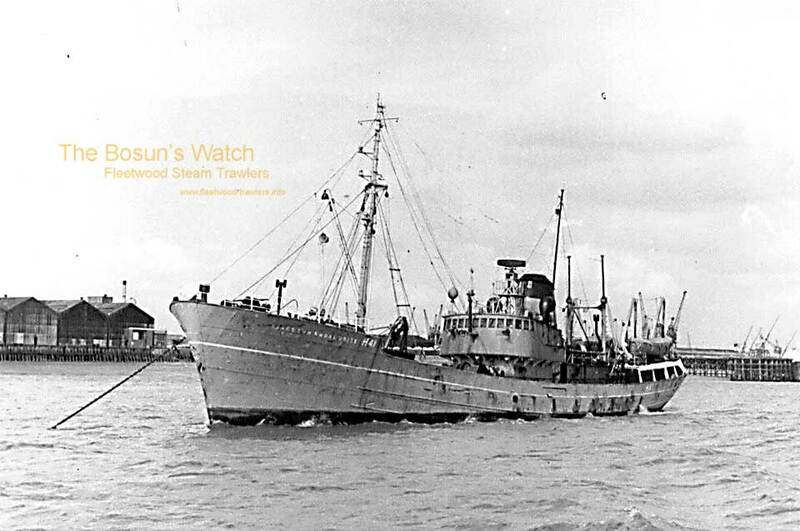 This entry was posted in Non Fleetwood Vessels, Steam Trawlers, Steamers (Picture) and tagged Marr on June 9, 2011 by Fred Smith.